Stretching the One Income Dollar: Is Swing Trading Your Ticket to Getting Rich? Is Swing Trading Your Ticket to Getting Rich? You’re sipping mimosas on your hotel’s rooftop pool deck. A quick turn to the left and you have a full view of the city of Barcelona. Just to the right, you watch the sea swing back and forth against the shoreline. Your alarm sounds. Time to crawl out of bed and sift through the kitchen until you can manage that first sip of burnt coffee. Why is it always burned? Stop what you’re doing right now. You’re never going to get to sipping mimosas working that 9-5. Something has to break the cycle. Swing trading is a way that you can make money from your computer, and in turn, anywhere in the world. You have two choices: get ready for your 9-5, or read on to learn how swing trading can make you rich. To understand swing trading, you must first understand day trading. Day trading is a strategy that investors use to monetize the market, whether it be trading currencies, stocks, or contracts. When using a day trading strategy, investors will open and close multiple trades within the same day. Swing trading is another strategy that investors use. Here, investors will open trades and wait several days before closing them. In a nutshell, swing trading is long term trading compared to day trading. Swing trading has it’s pros and cons, for example, swing trading typically yields higher returns, but it also takes a higher starting capital. There are a lot of beginner traders that will tell you stories of making thousands of dollars their first week of trading. While these stories are great, there are even more traders that will tell you stories of how they lost everything their first week. The traders that start out making thousands of dollars with their first few trades are actually the ones that are most likely to lose everything in the long run. Swing trading has a lot to do with psychology. If you think you’re just naturally good and don’t need to practice, you’re likely just on a lucky streak and are testing its limits. Think of swing trading as if it were a game of chess. There is a high level of skill involved in a game of chess. You’ll need to be able to predict your opponent’s next move based on the last and previous games they’ve played before. Even still, the game is never a “for sure” win, because sometimes your opponent will try to trick you up and play a move they’ve never played before. So is it luck or skill? Our answer, mostly skill with just a touch of luck. Will Swinging Make You Rich? The million dollar question: will swing trading make you rich? The easy answer? It’s up to you. 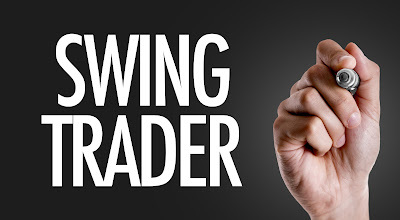 Think of learning to swing trade like you’re starting a business. Will Jimmy’s ice cream stand make him rich? Well, if he turns it into a dairy queen then heck yeah! Swing trading is what you make of it. If you put in the work and study, as well as maintain a proper risk management strategy, you’ll be surprised how far it can actually take you. Risk management is what’s going to keep you from losing everything on just a couple of trades. Experienced traders suggest a risk management strategy of 1-5%, meaning you should never risk more than 1-5% of your capital at any given time. Regularly practising risk management is arguably the toughest part about trading. It sounds easy, but when you put it into perspective and realize that 1% of $100 is only $1, it gets a lot tougher. We cannot stress this enough. Always practice on a demo account. Most brokers offer free demo accounts. If you can practice with fake money in real time, there is no reason why you should be practicing with your own money. Just because you made one amazing trade that put you into thousands of dollars profit, doesn’t mean your next trade you won’t lose everything. If you think you know everything there is to know about trading, you probably haven’t even scratched the surface. Swing trading is an ever-changing field and you’ve got to be able to keep up. The market moves, and you should too. Don’t let yourself get cocky, because that’s how you lose everything. Got all your notes together? If you take our advice and follow a proper risk management strategy, you’ll notice that you’re making small profits in the beginning. This is expected. Remember, higher returns mean higher risk. That being said, half the battle is knowing how to optimize your returns. Check out this article to help you make the most of your risk management. No one ever said that swing trading would be easy, but we did say that it’s your ticket to mimosas and beach bodies. Stick to it you’ll never go back to a 9-5 again.